Concern over depleting ozone and climate change – and both the public and celebrities are expressing it – has led to advancements in renewable energy technology that conserve the resources we have today and secure a reliable energy supply for tomorrow. These developments made footprints around the world, but they have left an indelible mark on Texas. 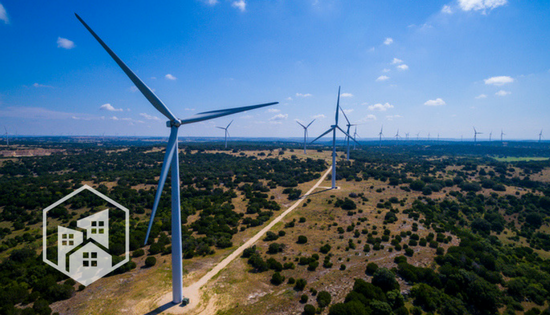 Once known solely for fossil fuels and coal production, the Lone Star State today is home to another major energy source – wind power. If you live in Texas, you no doubt have seen the exponential growth of wind projects dotting the state – but do you ever wonder how they work? While we aren’t engineers, we gathered details on the mechanics and benefits of wind energy, as well as unique factors that make Texas such a major player. Most people think wind energy is powered by turbines with blades that catch the wind to make electricity happen. However, the mechanics are slightly more complex than that. So, how do wind turbines produce electricity? Propeller-like blades catch the wind and cause them to spin. Energy caused by the blade’s movement turns the main shaft. The main shaft is connected to a generator that then makes electricity. Electricity produced by turbine generators is sent to a substation for collection before being transmitted to the electricity grid, where it can be distributed to customers. Notice a trend? Wind energy producers are highly concentrated in the west. While Iowa and Oklahoma are major contributors of wind power, they produce the most energy in the evening when home energy use is as its lowest. This highlights the main catch with wind energy; without wind, there is no electricity. Due to current limitations in energy storage, much of the power produced by turbines at night is lost. In Texas, however, wind also blows in the middle of the day, when energy usage is at its peak in a phenomenon called convection currents. If convection sounds like we’re talking about heat, that’s because we are. Wind is a form of solar energy caused by the uneven heating of the atmosphere by the sun, irregularities on the earth’s surface and rotation of the Earth. These elements vary across the U.S. and are affected by vegetation, water and landscape. You may enjoy this Texan wind flow while surfing or sailing, but it also creates the perfect environment to generate electricity. We asked the expert: Why is wind one of the most viable sources of energy? Last year, wind power made up just over 5 percent of the energy grid. Although the contribution may seem small, wind projects are experiencing a swell of support – to the ring of $13.8 billion for new turbines in 2016. Why are energy companies investing in wind projects? We spoke to Ecotech Institute Program Director Auston Van Slyke about wind energy and six reasons he believes it’s one of the most viable sources of energy. through power factor correction and energy storage. for livestock, farming, or even mining. No other power plant can say that. gallons per hour. Fresh water is a valuable commodity, more so in some geographies. their power output up or down with a click of a mouse. that is diverse, we will never have the lights go out. What is wind power doing for Texas? Some consider wind turbines noisy, 200-foot eyesores that detract from the land’s natural beauty. In parts of rural Texas, however, turbines mean job growth and a remodeled economy. Existing wind farms, as well as those in the works, are proof of the positive effects they have on local prosperity and culture. To service the more than 11,000 turbines in the state – and countless in planning and production – career opportunities appear in areas where there otherwise may not be, such as in Sweetwater, TX. The largely rural town is home to four of the 11 largest windfarms in the world, according to an article in The Guardian, on the Sweetwater Wind Farm. You won’t find any cowboys around these parts; managing these farms are wind turbine engineers earning an average salary of $50,000 per year, helping to stimulate the local economy and changing the rural culture Sweetwater. Across Texas, green projects are being built in similar areas and stimulating local economies. Recently, Duke Energy invested more than $1 billion in wind farms along rural areas of the Texas Gulf. Although oil and coal remain the main sources of energy in Texas, wind power doesn’t look too far behind. Ever wondered how other power sources, including those you see in the movies, work? Check out how iconic fictional power sources would work in real life.